Poll: Who should be the Republican candidate in next year's US presidential election? The race to be the next US president is already underway. Barack Obama has declared his intentions to run for re-election but who should be the Republican challenger next year? 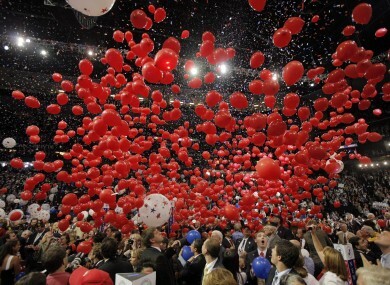 Balloons fall at the 2008 Republican National Convention in Minnesota. THE RACE TO be the Republican nominee for the US presidential election next year is already under way with nearly half a dozen candidates mentioned as possible challengers to incumbent Democrat Barack Obama. This week a poll found that despite the early campaigning by the likes of former Massachusetts governor Mitt Romney and former Speaker of the US House of Representatives Newt Gingrich it was in fact former New York mayor Rudy Giuliani who was the most popular choice among voters. He came out just ahead of Romney and 2008 vice presidential nominee Sarah Palin who looks set to declare her intentions in the coming weeks. One man who has ruled himself out is business magnate Donald Trump, but others to emerge include former Minnesota governor Tim Pawlenty and 2008 candidate Ron Paul, known for his outspoken criticism of US foreign policy. A number of other fringe candidates have thrown their hat in the ring but today we’re asking of the following choices, who would you pick to be the Republican nominee for next year’s presidential race? Email “Poll: Who should be the Republican candidate in next year's US presidential election?”. Feedback on “Poll: Who should be the Republican candidate in next year's US presidential election?”.